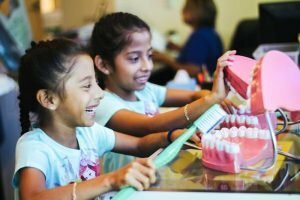 Our mission is to improve the oral health of children in Orange County through collaborative programs directed at prevention, outreach and education, access to treatment, and advocacy. Healthy Smiles is one of the only providers of sedation services (such as treatment under general anesthesia) for kids at no cost in Orange County. Services are provided both at the Garden Grove Clinic and at CHOC Children’s. This is a vital services for children with special needs, children that require extensive treatments, and medically fragile cases. Sedation can help increase cooperation and prevent injury by helping children remain still around dental instruments. Healthy Smiles is at the forefront of telehealth technology and currently operates one of the biggest school-based teledentistry programs in the nation. Children receive a full dental check-up (including a cleaning, fluoride, and x-rays) in the convenience of their own classroom. A dentist reviews the data offsite and creates a treatment plan. This strategy tackles traditional barriers to care such as a lack of reliable transportation and parent work schedules. Our three Smile Mobiles (soon to be four!) visit school and community sites across Orange County to provide both preventative and restorative services. Most recently, we have been using our Smile Mobiles to provide care on Saturdays at easily accessible community sites in order to reach patients that cannot make it to our clinic. Best Pediatric Dentist experience! The Tooth Fairy Learning Center is amazing! Fun and educational. My daughter loves it! I highly recommend this office. They are wonderful! Very fun, low stress office environment and awesome staff! So thankful I found this place.. They emphasize oral health through prevention and education. My 2yr old hated brushing his teeth until the dentist showed me her technique. Now he’s much more cooperative. Plus their tooth fairy reward system encourages kids to brush/floss. Highly recommend. We love coming here for my daughters dental needs. They are a friendly staff and she loves getting checked out by the Dentist so she can earn her dental bucks! Tooth decay is the most common chronic childhood disease resulting in 51 million lost school hours each year. 1 out of 3 Orange County children have untreated tooth decay. 1 out of 10 Orange County children have never visited the dentist. Since our inception, the average age of children at their first visit to the dentist has dropped from 5 years to 2 years. Eight of the pediatric dentists in our residency program have stayed in Orange County.